The birth of Little Wrigley began at the Cooperstown Diner in the heart of baseball country in 2004. Pat O’Connor was having breakfast with his fellow SABR (Society for American Baseball Research) buddies during their annual pilgrimage to the Baseball Hall of Fame. They were discussing the growing popularity of Little Fenway and what enhancements were needed to the field. The discussion turned to what field would be a nice complement to Little Fenway. The consensus among this group was Wrigley Field. Pat received encouragement from his wife Beth to begin the ground work for Little Wrigley. He talked to Travis Roy and Travis suggested we find a field near Little Fenway and throw down some bases where additional tournament games could be played. After all, he said, these teams do not have to play all of their games at Little Fenway. So the Wiffle ball construction team threw down some bases for a second field to enable additional Travis Roy Foundation tournament games. Only they got a little carried away. It was so much fun building Little Fenway that they decided to replicate that fun and build Little Wrigley. After all, a second field was easier than the first, right? Major excavation work happened in the Fall of 2005 and the summer of 2006. Care was taken to build trenches for drainage on the first and third base lines. Once all of the big rocks were removed and the dirt was leveled to within a few inches, the first grass seed was planted and the team went to work digging holes for the wall. On January 16, 2007, Bill Livingstone took advantage of a mild winter day to nail the last sheet of pressure treated plywood on the Little Wrigley wall. When the snow melted in April 2007, Larry Riegert started painting the Wrigley wall using a brick stencil normally used to paint a basement floor. 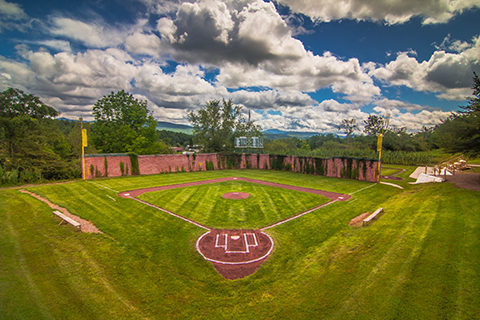 The infield was cut out, the warning track was added, and 14 ivy plants were planted at the base of the outfield wall. Ted Yeates and his Kubota orchestrated the construction of the center field deck and massive Little Wrigley scoreboard. Over 200 bags of concrete were used to support the steel pillars holding up the scoreboard. Dave Robideau and his IBM colleagues added the Little Wrigley flag pole. The foul poles were made with the same design used at Little Fenway. On August 10, 2007, at the opening of the 6th annual Travis Roy Foundation Wiffle ball tournament, a ribbon-cutting ceremony was held and the first game (without lights) featured a team of celebrities vs. a team of tournament sponsors. Bill “Spaceman” Lee, Bill Monbouquette, Dave Barger, Lee Roy, and numerous other special guests participated in this grand opening. Steve Cormier hit the first home run at Little Wrigley. On July 4, 2008, an Independence Day celebration was held at Little Fenway and Little Wrigley much like the grand opening of Little Fenway in 2001. Tom O’Connor, Pat’s father, put the last brick in the Little Wrigley wall. It was a real brick from Chicago’s Wrigley Field.